I did that thing the other night, Halloween actually, where you're invited to a party and can't decide exactly what to bring. At first I said I'd bring a hearty salad of some sort, but as soon as I heard the word salad leave my mouth, ideas for savory tarts started flitting around my brain. And wow, is that a pâte sucrée tart shell in the freezer? Maybe I should make something with that. I also decided, right around the same time, that it would be a good idea to bake cookies for trick-or-treaters instead of handing out candy. I was looking at a long day in the the kitchen for sure. I got an early start, and in the morning collected ingredients from all my favorite shops. It was beautiful and sunny out, and hey, we should really go for a walk. And do you want to try someplace new for lunch? And, and.....and somehow the day snuck away from me in a hundred fantastic ways. In the end, a spinach tart made it next door, and the neighborhood kids got freshly baked cookies, and the chocolate tart made it out of the oven, but not to the party. And this salad never made it out of my head. It had to wait until later in the week to make an appearance. But I thought I'd share it with you because I liked how it turned out. The idea was a simple roasted potato salad incorporating a couple other seasonal root vegetables like parsnips and carrots. I served it on a bed of wild rice - all with a simple mustard vinaigrette. I've think I've subliminally been on a bit of a mustard bender since I returned from Paris. Also, I should mention, embarrassingly enough - that when all these roasted beauties finished their term in the oven, I noticed the parsnips waiting patiently on the sideline, quiet as church mice, raw as ever. They never made it onto the pan. I'll include them in the recipe though, because they were supposed to be there . 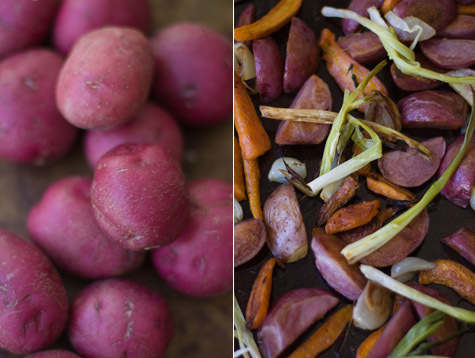 I used some charming pink-fleshed, huckleberry potatoes (or at least I believe they were huckleberry potatoes), but any small, waxy potatoes will do. Also, on the mustard front, I seek out plain whole-grain mustard for the dressing - no added herbs. Also, and I've mentioned this before, wild rice takes some time to cook, so I make up big pots of it, drain it really well, let it cool, pack it into freezer bags, and freeze it. It freezes beautifully, and makes quick work salads like this - perfect for soups too. And one last note of importance, do your best to cut your vegetables into pieces of similar thickness, so they roast in a similar time frame. In a large bowl toss the potatoes, carrots, parsnips, and shallots with 1/4 cup of olive oil and 2 big pinches of salt. When the ingredients are well coated, turn them out onto a large baking sheet in a single layer. There will be a bit of residual oil in the bottom of the bowl, gently add the green onions to the mixing bowl and push them around a bit until they are coated as well. If there is room on your baking sheet add the onions in their own corner (they take less time to roast and you will need to remove them), or place them on their own baking sheet. Place in the oven. The scallions will likely finished baking first, remove them when they are well-browned, roughly 20 minutes. The rest of the vegetables usually take somewhere between 40 and 60 minutes. Let them go until they are deeply golden and tender throughout. Check them regularly, flip them with a metal spatula once or twice along the way, and if any of the smaller pieces are getting too dark pull them off the pan. While the vegetables are roasting, start the dressing by pouring the red wine vinegar into a small bowl along with the chopped shallot. If you have the time, let it sit there for twenty minutes or so. Then whisk in the mustard and salt, before slowly drizzling in the olive oil, whisking all the while. Whisk in the cream, taste and adjust with more mustard, vinegar, salt, etc to taste. When they are done roasting, remove the vegetables from the oven. 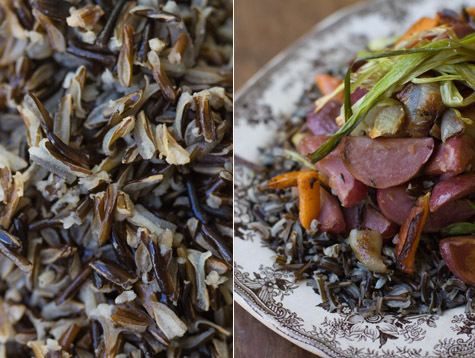 In a large bowl toss the wild rice (if you're going that route) with a splash of the vinaigrette. You can now either transfer the rice to a serving platter, as a bed for the vegetables, or you can add the roasted vegetables to the bowl and toss them with the rice, the rest of the dressing, and half of the scallions. Turn everything out onto the platter and serve topped with the remaining roasted scallions.